Veteran Manchester United midfielder Michael Carrick has gone on to reveal the player he believes will replace him at Old Trafford once he exits the club in the summer of 2018. The 36-year-old ex-England international is expected to join the backroom staff of manager Jose Mourinho after his retirement. The versatile midfielder, who went on to miss a majority of the games this season due to an irregular heart rhythm, has made a comeback to the squad in order to help his team for the remainder of the term. Carrick feels Manchester United will opt for the promising academy talent Scott McTominay as his replacement. The youngster has featured 14 times for the club after making his debut towards the end of last season. McTominay has been given a good amount of game time by Jose this term, and has been praised for his qualities. 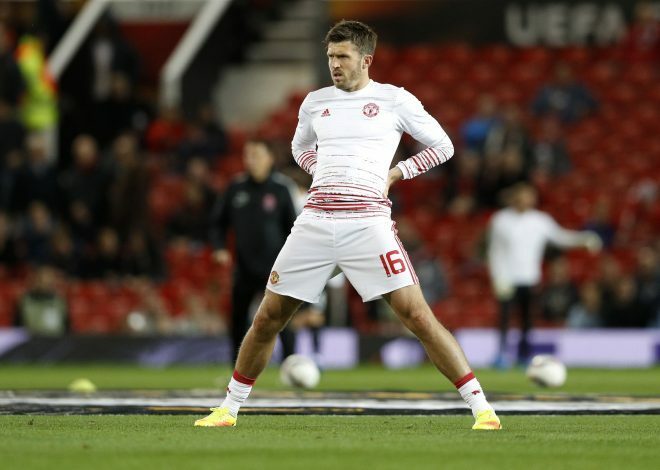 And Carrick, in an interview with MUTV, has stated that the 21-year-old youngster could very well go on to take his place. “I know he will take my place some day and that is not something I would be afraid of, or try to put him off, because it is important to help the future and Scott is definitely that,” said the United legend. The club skipper also praised the youngster’s attitude and assured he will help the latter as much as he can. “He is willing to learn and listen. That is one of the biggest things for a young lad, to have that attitude. Of course I am here to help him and I try to do it as much as I can,” Michael explained. Carrick joined Manchester United in 2006 under former manager Sir Alex Ferguson, and since then, has gone on to appear 462 times for the club, scoring 24 goals in return. He has made just three outings this season, and was recently seen as a second half substitute in the club’s 1-0 loss against Newcastle in the league last weekend.